Suzanne Liggett, MS Ed., E-RYT, RCYT has loved practicing yoga, teaching, and helping others all her life. Certified among the sacred energy of Bali, Indonesia and renowned teachers like Vidya Heisel, Jennilee Toner, Shiva Rea, Bikram Choudhury, Gopala Jaffe, and MC Yogi, Suzie brings a unique and eclectic style to her classes. Students will find her classes infused with breath, flow, humor, and of course essential oils! 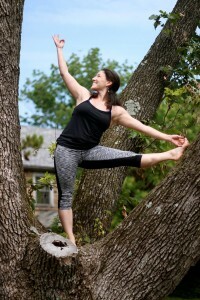 She is an Educational Consultant with Heart&Soles Yoga and Educational Services and develops health and wellness programs for schools, businesses, and organizations. Suzie is also a Wellness Advocate for doTERRA and holds workshops and private consultations to guide people on their path to perfect health, joy, and lightness. She is a certified Reiki practitioner and AromaTouch Therapist. She can be reached at suzanne.liggett@gmail.com or 215-692-3040.